Starting a small farm is a beautiful dream. Equally important is to know your costs and capability in the first year. Rows of bountiful green spinach, vines of beans hanging low, juicy tomatoes hanging down from the branches, and sweet red strawberries running across the field; a farm life has beauty and abundance which many people have dreamed for, at least once in their lifetime. As the saying goes “You need a farmer three times during a day.” Living the dream is a totally different experience. Whether it’s someone who manages a small garden or a large multi-acre farm, dealing and accepting the vagaries of nature and one’s own limitations are lessons that are constant challenges. As farmers, we learn to be judicious with our resources, we realize those factors that are out of our control, and we accept that being on the farm means both pleasant and unpleasant surprises from time to time. 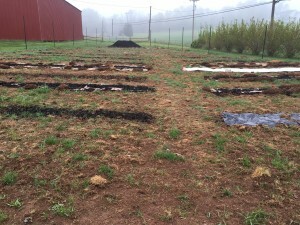 Many beginning farmers start a small farm with hopes and realistic expectations. They do research, gain field experience, travel the world WOOFing in different countries, all to make themselves better prepared for the farming world should they decide to start their own agriculture enterprise. However, all of the experience of working on another farm can prepare a farmer for everything except managing capital. A lot of perspective shines from “above” when one’s own money is at stake. How come I never knew this? And, being new to farming, financial aid from government or incubator farms is often out of question. Most agricultural loans for farmers are for those who have tested their idea for three to five years and know what they are doing. Not for those who are just starting out and dream about lying in their serene fields waiting to see Aurora Borealis at night. Since money is coming from your own pocket, a farmer thinks twice before making an investment. And even after all that thinking, one may not be ready for the initial capital costs that come up along the way. The wisdom says it is good to start small, it minimizes risks. However, even when starting on a small scale, the costs can easily add up. Add to this the uncertainty of weather, soil and not knowing where to sell your produce, it’s enough to wake a person at untimely hours of night. Like one night in April 2016, I woke up at 3:00 am by the sounds of gusty winds and frightened by the thought of my hoop house blown away on the road. I covered my face in blanket and tried to sleep to take care of it in the morning since it was pitch dark outside. The next morning my husband told me he went out at night to fix the hoop house as one side of it was lifted in the air by strong winds. With the northeastern weather, an amount of initial investment goes towards unforeseen damage control and measures to protect your plants (or bearing the cost of weather related damage) from the harsh weather. 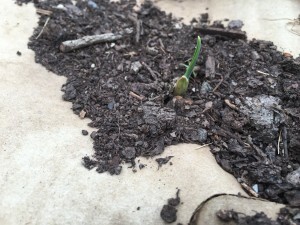 Sure, some cold hardy plants have tolerance toward cold, but once young seedlings are out in the field, they are in the hands of Mother Nature. When you work on someone else’s farm, capital cost is something which you tend to ignore while gaining the valuable field experience. It is only when one starts on their own two feet and after dealing with some ups and downs that we realize what all can be done within your resources for protective and corrective measures. One has to realize, as a beginning farmer, that one cannot control or offset all that is bad (weather, aphids, groundhogs, drought etc) right during their first few years. I started farming on a half acre piece of rented land in March 2016. 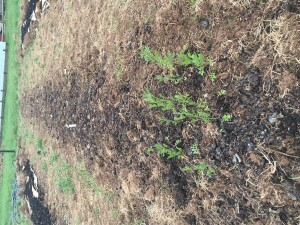 I am growing 10-15 different varieties of vegetables and herbs organically this season. Even before a seed had sprouted, my costs of building the infrastructure and material costs to start seeds indoors, was higher than I expected (seeds, potting mix, seed trays, building a small hoop house etc). Though I had sufficient savings from my day job that I quit last year to cover the costs, I still wanted my costs to be low. There is no shortcut that I could think of since some very basic infrastructure has to be set up. The costs can be daunting to someone who has not even tested the feasibility of their idea and explored the markets. Any new endeavor starts with a degree of optimism and a degree of self-doubt. There are always unexpected costs that are encountered when one starts a farm operation. It is most often a dilemma whether a certain investment is beneficial in the long run or a quick fix to do damage control. In farming, there is always more than one way of doing things based on location, resources and help at hand. Should I ask an expert for benefits of sheet mulching or should I just lay black plastic, what kind of irrigation system to use, should I take university courses or learn on the go, all such and many more questions arise when money is at stake. I do extensive reading on topics where I need help or those that are unknown to me. There is a lot of advice for new farmers on ways to save money and be productive and be healthy and establish peace on earth. I have utilized a lot of advice from the wealth of information available on internet but still found that even the best tools and most efficient time saving techniques do not always save money and work for me. But advice on certain topics has helped me from time to time. However, there is only so much a farmer can accomplish within the first few years of starting his operations. Money has to be put on table in order to best utilize it for one’s purpose. The learning and risks for a beginning farmer is manifold when his own stakes are involved. Doesn’t mean one has to become bankrupt to learn (you can stop before that) but one has to have a certain degree of mental grit to experiment with their own money (and some cushion to be safe). I am totally new in the city where I have started my small farm operation. It took two months to recognize the faces of neighbors after winter turned to spring and people finally got out for running and walking their dogs. Starting in a new place is challenging because it is takes some time (and fun) to get to know people and markets. The risk of investing in infrastructure and committing time for the farm seems all the more daunting when you move to a place where people, land, and weather are all greeting you for the first time. I welcome challenges even if they bring a little fear. My initial investment in my farm has till now crossed $1300 when I initially thought I would only invest $500. Could I have saved the money by just throwing seeds on the ground and waiting for them to turn into plants? Probably not. I am attaching a list of all the materials I invested in my farm this year. Whatever investment I have put in my farm, I have found it to be necessary. The next time you come across a small farmer who is just starting out, know that he may not share his troubles with you or ask for help. Get personal and make him feel connected. Help him know you. Words of wisdom, opportunities to network and making sure he feels encouraged to pursue his endeavors are indirect ways to help your farming community. Like all business ventures, farmers, big and small, should have a team of enthusiastic people, within their enterprise and outside, who share their vision of growing safe food for the community.